After 13 tortured years, Boston’s massive Columbus Center development is officially dead. The project’s main backer, the California State Pension Fund, known as Calpers, said yesterday construction of the $800 million mega-complex is no longer economically feasible and that it was unwinding its involvement. The decision, coming one month after the state told the developers they were in default of their lease, ends one of the most ambitious and controversial developments in Boston’s history. Columbus Center was to be a towering five-building complex of condominiums, hotel rooms, and stores that would have straddled the Massachusetts Turnpike and united the city’s Back Bay and South End neighborhoods. But with neighbors and local politicians aligned against it, the project eventually collapsed under its own ambition. By the time Calpers and its local partner, the WinnCompanies, had navigated an exhaustive public review that included more than 130 community meetings, the project had become so expensive and the economy so weak, that the developers could not borrow the necessary funds to build it. While the site has been moribund for nearly two years, yesterday’s an nouncement by the pension fund amounted to an official death notice, prompting a collective exhale from neighbors and local leaders whose lives have been dominated by the saga. The legislators and others said there is still some unfinished business with the current development team: getting Calpers to fund a $4 million to $5 million cleanup of the site, which was cleared and partially excavated before construction was halted two years ago due to financial troubles. “We believe it’s the developers’ responsibility to pay for that work,’’ said Colin Durrant, spokesman for the Massachusetts Department of Transportation. Stockbridge declined to comment beyond its statement. While WinnCompanies, and its former chief executive, Arthur Winn, have long been the local public face of the project, Calpers is the lead equity partner and has been making decisions on the project over the past several years. The development team previously estimated it had spent more than $120 million on the proposed project. Columbus Center was first proposed in 1997, after WinnCompanies was given the exclusive development rights through a noncompetitive process run by former officials at the now-defunct Massachusetts Turnpike Authority. Arthur Winn had proposed a sprawling complex whose tallest building would have reached 35 stories, angering neighbors and others who said it did not fit in the neighborhood. Winn — whose expertise was in affordable housing, not large-scale commercial development — teamed up with Calpers to add the financial backing to move the development forward. He also agreed to provide $53 million in public benefits, including three parks and future park maintenance, recharging of groundwater wells, and dozens of on-site affordable housing units. Over the years of public review, Columbus Center’s estimated cost more than doubled to $800 million. That prompted Winn to launch a lobbying blitz for millions of dollars in public subsidies, and what ensued was classic high-level Boston political drama. Winn earned the enmity of former House speaker Salvatore F. DiMasi, who while in office used his leverage to repeatedly block Winn’s attempts to get public funding. Eventually Calpers took control of the project’s management, but it, too, was unable to get construction going beyond site preparation. In February, Massachusetts transportation officials slapped the developers with a default notice, saying their failure to either continue with construction or properly restore the site constituted a violation of their 99-year lease of the state land on which Columbus Center would be built. State officials said they will look for a new developer, but first must deal with the cleanup issues, which could take months, or even years, to resolve. Complicating matters for the state is the fact that attorneys for the Massachusetts Turnpike Authority failed to secure collateral that can be used if the developers refuse to pay for site restoration. Boston officials yesterday urged swift resolution to the matter to improve life for Bay Village residents whose neighborhood sits adjacent to the construction site. They also said they will work with state officials to design a new process to encourage development of the property. State Representative Martha Walz, whose legislative district borders the site, said any new plans should comport with a planning document devised by the community in the 1990s that calls for parks and low to midrise buildings. “This is a great opportunity for us now to regroup and put these parcels back out to bid for the next developers,’’ she said. 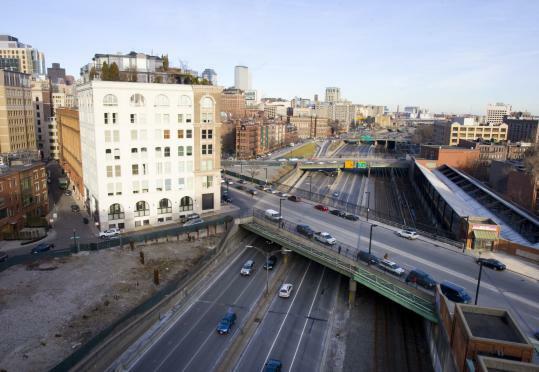 Check out architectural renderings for Boston's stalled projects.